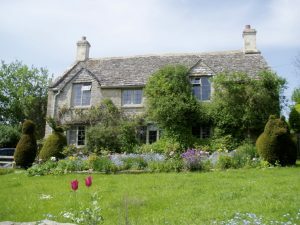 I have developed this little itinerary for a happy day’s car tour of the North Cotswolds from Turkdean. A lovely village with a Post Office, a bakery and two pubs! and back home once more! If you’re not in a hurry try what I call the wiggly way to Burford: a single lane with passing places through Farmington, Sherborne (where the award-winning village shop is a splendid tea stop) and Windrush to Burford. The lane snakes beside the winding River Windrush looking like a Turner painting, often with cows paddling. 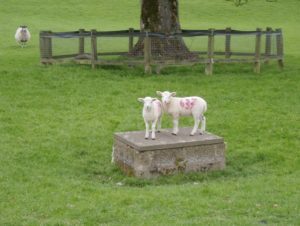 Blenheim is half an hour on from Burford, but you could easily spend the whole day at Blenheim. As well as the Palace itself (Churchill tour AND the State Rooms) there are huge formal gardens, a miniature train, a massive maze, an adventure playground and there’s even a butterfly house in the Summer. 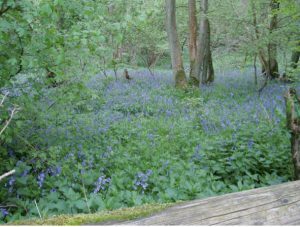 Countryside Code: please remember to follow the Countryside Code and show respect for the countryside. In particular, always keep dogs on their leads where there are grazing animals. Leave all gates as you find them either open or shut. Last but not least, don’t forget to take your rubbish and empty bottles home for disposal. Dress: appropriate clothing should be worn for the time of year and weather conditions, but stout shoes or light walking boots are recommended. Don’t forget to tell someone the route that you are going to take before you leave and provide some indication of the time you expect to return. 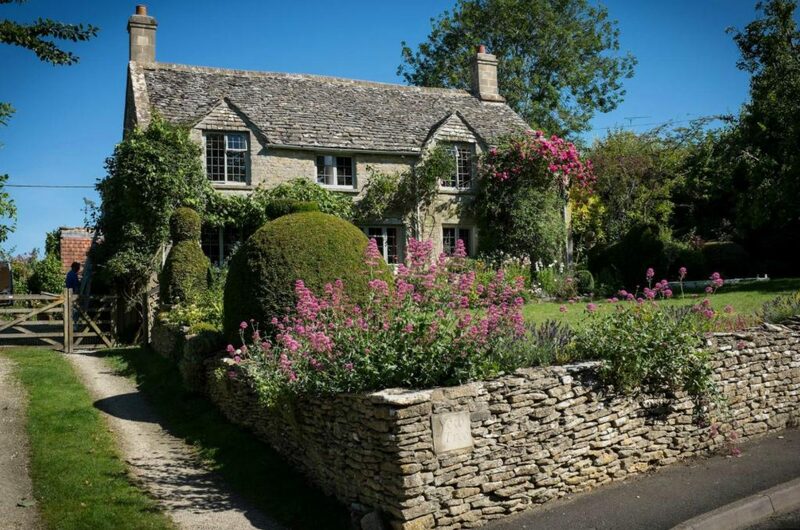 Key Features: This is an easy walk along well-defined tracks and footpaths passing through typical Cotswold countryside with its lovely villages, beautiful rolling hills and vales, grazing animals and an abundance of local wildlife. 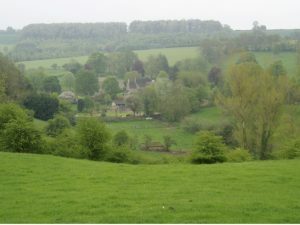 The route takes in parts of the Diamond, Sabrina, Gloucestershire and Macmillan Ways. (N.B: each of these is classed as a long distance path.) By studying the map it is easy to look for a suitable path to shorten the walk if preferred. 1. From Yew Tree Cottage turn left and walk up the hill round the bend and then take the public footpath down the track on the left side of the road immediately after Manor Farm. 2. Follow this track down into the valley and follow it through pleasant pasture for 1km until you reach two field gates. 3. 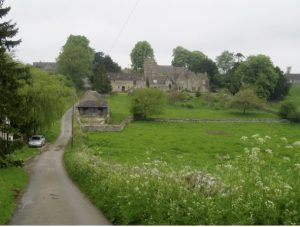 Walk past the first gate and after 10m take the second gate to the left and follow the track past a copse on the left on rising ground past a large barn on the left, with a farm on the right until Hazleton village is reached. On reaching the mettle road turn right at Priory Farm through the hamlet and past the church and crossing the road towards Hazleton Grove Wood. 4. After 1.5km meet the Gloucestershire Way at Salperton Park. 5. Turn right on to this path and follow it past game breeding pens to Farhill Farm after 1.5km. 6. After the farm the path passes through arable land to a field gate in the valley. Pass through and bear ½ right to a second gate after 200m. Pass through and then turn left up the hill to the road after 0.5km. 7. At the road turn left and after 100m turn right after the cricket field on the right taking the road towards Notgrove. 8. After 400m follow the footpath sign left and go diagonally across pasture to a village road. Cross this, enter a second field and walk diagonally to the right on to the road. Walk past the church and follow the Gloucestershire Way signs through a meadow past Shrub Coppice. At the track turn right and after a few metres turn left along a tree lined bridle path for 0.75km until a road is reached. 10. 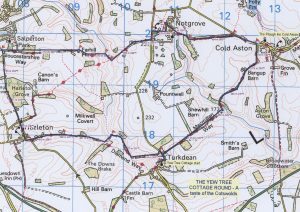 Take this track to the right and follow it for 3km until you reach Manor Farm at Turkdean. 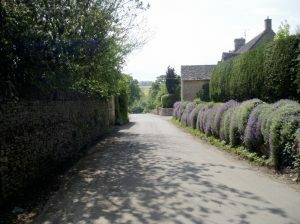 11, Turn left and follow the road through the village to Yew Tree Cottage for a well earned cup of tea and a cake. 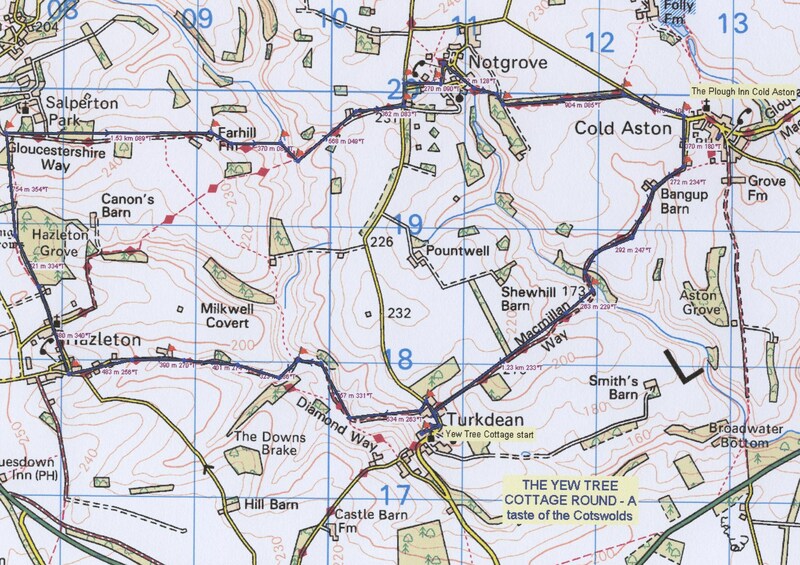 NB: the walk can be shortened by turning right at Hazleton church (at 4 above) and follow the track, then after 350m turn left and after a further 400m turn right and follow the footpath to join the Gloucester Way in the valley leading to Notgrove.